I've been hauling a little bit over the last month and wanted to share with you what I bought. There's a mix of highend splurges and supermarket bargains. I adore the Mecca overnight lip balm (which I've talked about here before) and they've released 2 new tinted day lip balms. I bought the Mecca Cosmetica Tinted Lip de Luscious in "Berry" which while looks dark in the tub, it's only a slight tint. I like that this also contains SPF 25. I do wish that they released this in a tube or pen like packaging as I hate using my hands to apply it. I also picked up the Stila Eyes Are The Window Shadow Palette in "Spirit" which has been on my wishlist for so long. It's almost too beautiful to use... almost! Mecca have released some brand new products and one of those was a really cool cosmetics bag. It was limited edition and sold out very quickly both online and instore here in SA. So of course it made me want it more. They also had a pack which had the same bag along with Mecca products. Because I couldn't get my hands on the bag, I ended up getting the gift pack instead! If you see it instore get it now as it won't be available again. It contained a face cloth, lip balm, cleanser, sunscreen, primer and eye brightener. While Aussies can purchase Charlotte Tilbury online from Beautylish, recently Charlotte Tibury's website offered free shipping to Australia to celebrate CT being available to Aussies via her website. Most of the products are slightly more expensive to purchase directly from the CT website, but because I only wanted 2 small items it ended up being better buying them with the free shipping offer. I ordered a pencil sharpener as I have a few and I can NEVER find one!! Lets hope I don't lose this one as it's so pretty! I'm also really interested in her make up brushes, but wasn't sure about the quality as I'm a brush snob. 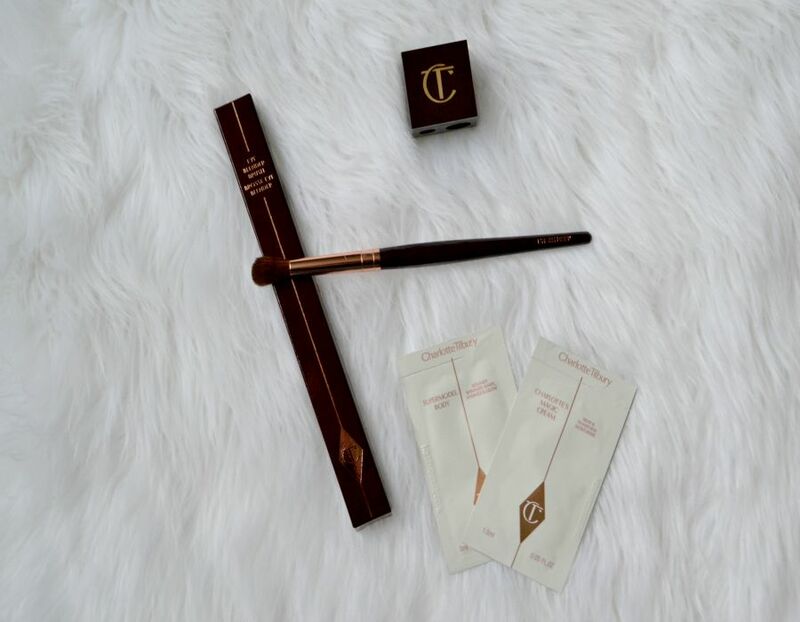 I ordered the Charlotte Tilbury Eye Blender Brush and it was love at first sight. It feels incredibly soft and smooth. Its very luxurious and now I want all of her brushes! I ordered on a Friday and received it the following Thursday. They wrapped it beautifully and also included 2 samples. I was really happy with their service! I also picked up some things from the supermarket. Coles are now stocking Not Your Mother's so I picked up the Clean Freak Refreshing Dry Shampoo. I really like this. It's light on my hair and helps to make it feel so fresh and so clean. Coles also had 4 or 5 other products from the brand available. Coles also is stocking Macadamia Professional. I love that the supermarket is starting to stock more luxe brands. I picked up the small size of the Deep Repair Masque because I go through hair masks like crazy. I picked up the new Maybelline Lash Sensational Mascara from Woolies as they had 50% off recently and I've heard some great things about it. And that's my small, but expensive, haul. Do you pick up any beauty products from the supermarket? Awesome haul!! I use to use the Macadamia Oil Masque and I loved it before moving on to another brand. I think I used two lots of it! The Mecca tinted lip balm smells A-Ma-Zing!!! I wanted to buy it but I didn't like the thought of putting my finger in the jar as it's tinted. I love seeing products on other people's posts that I haven't experienced yet. 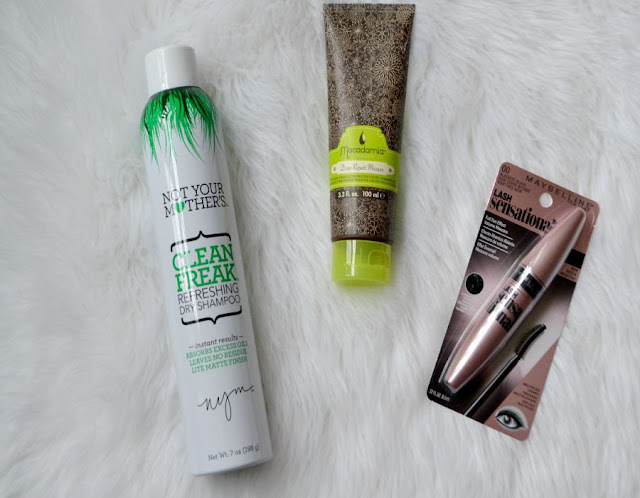 That dry shampoo sounds like a winner! Very curious to see Coles stocking those haircare brands! I need to pop into the supermarket more to check them out haha! 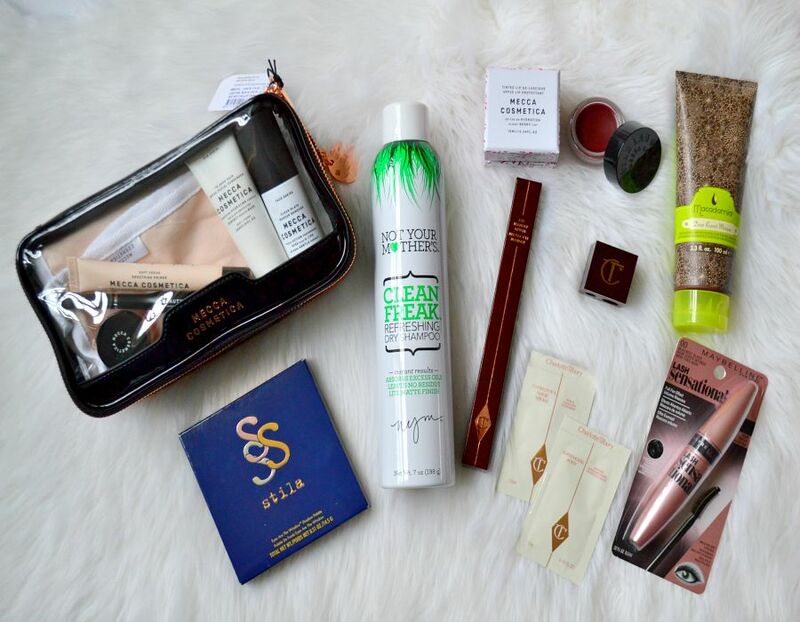 I love the look of the Mecca makeup bag, and the products inside look great too. Its so great! And works so quickly too! I bought the mecca kit as well- the face cloth is lovely for taking off face masks! I love the face cloths! I've previously bought a 3 pack of them. I love how they're double sided. Awesome haul! I really want to try the CT Matte lippies.